The project enabled us to develop a new partnership with Thames Valley University through the involvement of some of their students. Feedback from course tutors at TVU indicated that whilst the project was running, they saw an improvement in attitude and attendance from the young people involved. However, this improvement has not continued once the additional support offered by the project had ended. Participation in the project has helped the young people. Stephanie is likely to progress to Level 2 Music next year. Emanuel will complete the Level 1 course this year but it is unlikely that he will progress to Level 2 mainly due to attendance and punctuality problems. Luke might try another course in Arts & Design based on the type of support that will be available for him (see case study below). Steven and Nadeem (two rappers) have been removed from the music course at TVU because of attendance/punctuality and coursework problems. They performed well in the Urban Orchestra but needed a lot of support and encouragement to get them to attend and to work. On some occasions project workers had to collect them and bring them to workshops in order to ensure they took part. It was a great opportunity for our level 1 students to get involved with this project as it provided a great motivational incentive early in the academic year. We would very much like to continue our involvement because of the benefits this provides for a primarily difficult to engage cohort. I would like to thank you all at Readipop for giving our students at Thames Valley University in Reading the opportunity to get involved in such an event last year. The Urban Orchestra 2010 offered to some of our younger students the experience of a full scale show at professional standards with the support and creative direction of Readipop. Our students have benefited from the process by actively participating in the preparations and delivery of the performance. They worked and exchanged ideas and culture with other young, like-minded musicians and performers, adding to the local creative community. Everyone who was involved is really proud of their contribution and we felt that Readipop offered our students a great opportunity to showcase their talents. We would like to carry on working in partnership with Readipop in similar creative projects and look forward to the next Urban Orchestra. We are still committed to this exit strategy and ensuring that the project has a long term future. 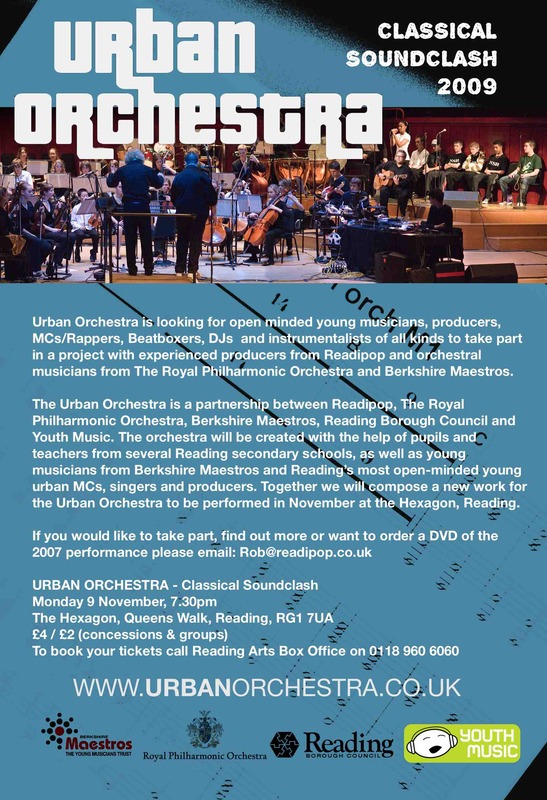 The main project partners – Readipop, Berkshire Maestros and Reading Borough Council – are working together to develop an ongoing partnership and to establish an annual Urban Orchestra programme and perfomances. The key challenge is to find appropriate funding partners and income to sustain this programme. What was the impact on the participants who took part? What did they tell you about their involvement in the project? We acknowledge that this will be subjective and a broad view, but it will help us to show what the project has achieved. Many of the classical musicians were introduced to new ways of playing music such as improvising, using their instruments to play different styles and generally being creative with their musical skills as well as learning to express themselves rather than playing what was written for them. Many of the young people involved now listen to styles of music they weren’t before the project. This is not only because of music styles the orchestra played, but also because they made new friendships with other young people who are a part of ‘scenes’ they hadn’t come into contact with before. One participant that I worked with was really rewarding. Luke was doing a music course at Thames Valley University. Because he had Asperger’s syndrome he found it hard to be part of social groups and to understand how he could have a role in a group scenario. I felt that the best way to work with him was to start on a one to one basis and then feed his output into what the group were doing. Luke created some lyrics about his view of mobile phones. He created a list of things that modern phones could do. He then wrote a melody line and turned this into a chorus for a song. At first his melody didn’t seem to fit the normal chord structures and progressions that we had challenged him to work to (this was a devise to ensure that any individual pieces could fit into a larger piece). So I set about trying to help him correct this. He became adamant that nothing could deviate from what he had written. So we started to deconstruct his melody and build some backing accompaniment to support. Going down this route I realised that he had fully understood the brief and was bending musical rules and displaying a real depth to his writing. The balance between melody and backing was so fragile that if a single note was wrong in the chords layers from the orchestral players then his song cycle wouldn’t resolve and could quickly fall apart. Luke’s autism meant that managing his expectations and how he spent the time when he was waiting for other participants was a challenge. However, he really took on board this new way of group working and successfully performed with everyone in the show. His song, for me, remains the outstanding moment in the whole piece. I still sing it now. Its involvement with a wide range of people in the Urban Orchestra is what makes it so special. We are able to manage large numbers of young people whilst being sensitive to individual needs. The best that anyone gets from being involved in a project like this is what you learn from others. ‘As a parent I thought it was a fantastic experience and a really great way to broaden horizons for kids who enjoy music’ – Parent’s comment. I joined the project on an internship to learn how Readipop operates and to observe and assist with The Urban Orchestra Project. I was present at workshops to collect data and document the progress of the project. I also assisted in the Readipop office to learn how this information was used. I also had the responsibility of communicating with all the young people involved, making sure they knew where they had to be and when. I liaised with some schools and teachers to arrange workshops. I event-managed the launch party of the Urban Orchestra ‘Calling You’ DVD. As a professional drummer I also got involved with some of the music making and helped with many aspects of the drumming within the project. I learnt how to work as part of the Readipop team. I learnt how and why a project of this nature is funded. I learnt how to document and collect data to monitor the progress of the project. I learnt how to project manage within a creative team. I learnt how valuable this type of work is for everyone involved, both young people and music leaders were left with a huge sense of achievement and personal development, myself included. When I joined the project my musical experience was of professional performing (playing with bands and artists) and one-to-one tuition (as both a student and tutor). Through this project I’ve been introduced to funded workshops and project work and I’ve been introduced to creative teaching and learning. The CPD part of this project seemed to be more beneficial to the local music tutors, as they were aimed at developing ‘leadership’ techniques for workshops – warm-ups, story-boarding, specific skillsets (the digital sessions). RPO resound musicians are engaged for their technical expertise as musicians, the inspiration factor, their skills at facilitating creativity in participant breakout groups, and of course their professional orchestral experience. I think a more valuable use of their time (in terms of cost effectiveness) would be to engage them to support and underpin creative workshop sessions with participants and the creative leader. The RPO resound musicians who participated in CPD did gain insight into the mechanics of digital side of the project (especially DJ-ing), but did not feel the benefit of this experience translated into the workshop setting because it was an isolated session and not enough time for any real osmosis of these new skills. Professional practitioners with these skills (from Readipop) were engaged during the project to cover these areas of expertise, so the RPO team felt their time/costs could have been better deployed using them for their expertise as instrumentalists during additional workshop sessions. Having previously taken part in a similar project I think that the CPD at the start of the course was invaluable insetting out the aims and objectives. It is also vital to share information on workshop ideas and strategies for achieving the most from the students in a limited time. It was a shame that the RPO representatives that worked through the CPD were not able to carry on working on the project, it meant trying to explain new concepts every time a new representative came. Personally the CPD was an excellent experience, it helped to quantify and reinforce our method of working. It was interesting to see participants of the CPD appear totally out of their comfort zone with relatively simple tasks despite their personal expertise in music making. The CPD helped me not to underestimate the impact of working in this challenging way, which in turn enabled me to set the right pace for learning. It was disappointing that the members of the RPO who joined us for the CPD sessions were unavailable to actually work on any of the project, particularly as they seemed to benefit the most from the experience. The result of this meant that the RPO members who were available for the project weren’t as creatively effective as they could have been. What was the music leader’s view of the completed project? This project has been very challenging and rewarding. The partnership with The RPO brought a new dimension to the project and taught us to value our own skills as music leaders when leading world class musicians from a respected orchestra. Our partnership with Berkshire Maestros has developed further and now looks set to continue as both organizations now have a more stable team going forward and a desire to collaborate on an ongoing basis. There were many individual successes within the project. However the real magic within this project came from bringing together so many young people from incredibly diverse backgrounds into one orchestra where each valued the input of the others. The young people felt an enormous sense of validation for their musicianship and creativity and were very proud of their involvement in the project as was seen at the launch of the concert DVD. For me the project exceeded my expectations. The piece was musically challenging but worked. The participants learnt to feel comfortable working within a set of parameters which weren’t entirely set in stone. This flexibility built their confidence by trying stuff without knowing what the outcome would be until it had happened. Putting their trust in the unknown, despite the fragility of that situation, gave them a real sense of risk. The theme of making music by using telephone numbers, although appearing quite a difficult task at the beginning, became a very rich vein for artistic mining. There was a need to consider an appropriate notation system for the new work created, with clear and consistent section/movement names, as there was confusion among participants during the creative process with regards to the shape and structure of the new piece. • After working with the urban singers on a couple of days in short vocal and piano sessions I noticed considerable rhythmic improvement – particularly with the rappers who understood more clearly how to feel the pulse of the music and identify the changes in harmony once it was orchestrated for the full ensemble (as opposed to just voice and piano which they fund easier to start off with). • The brass players benefited hugely from working with the RPO resound trumpet tutor, who spent time teaching them warm-ups and technical exercises. It was noticeable by the end of the main project because they were warming up properly and independently for the main performance. I believe the project was a great success. 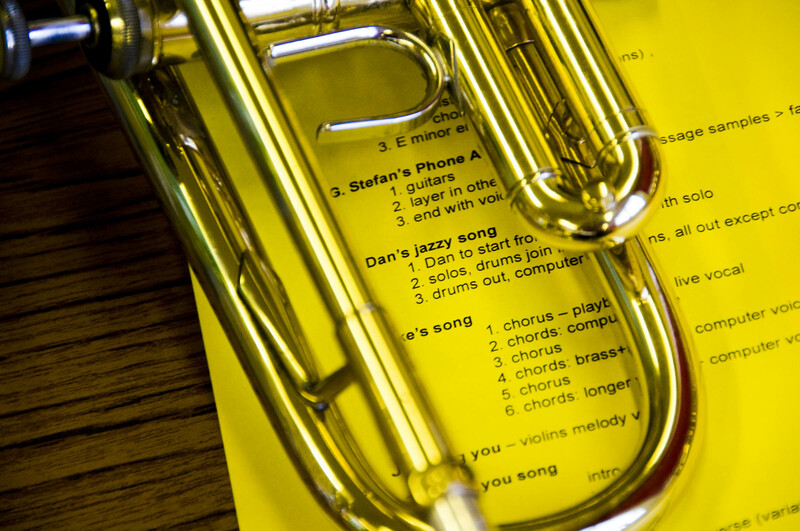 The combination of school and Maestros musicians and different musical genres worked well. I think that all students felt they had played their part in writing the material. As a leader it was a little tricky not to have consistency in RPO involvement. The students showed that by working together over a period of time you learn people’s strengths and how to draw upon them. Although each of the RPO representatives had something to offer I felt that some failed to grasp the concept of the project. Having to try and explain what we were doing every time was a bit frustrating and if RPO leaders did not understand the concept their artistic involvement with the students could be a little constrictive. In terms of impact on participants, they were amazed at how everything came together. I think they did not realize at the outset how much music they could write and were amazed with the quantity and quality of the final piece. Watching the DVD a few months later it was very evident that the students were very proud of their hard work. The fact was that with a deliberately very open stimulus for the composition they had been able to mould their ideas into a final piece spanning many musical ideas. They thoroughly enjoyed it and got a great sense of achievement because they knew that they had created the final piece themselves. I think the most obvious impact was observed in the interaction between students from different backgrounds and musical experiences. At the start of the project the students showed the usual apprehension of working with new people from different musical backgrounds. By the end of the project they were interacting in a relaxed manner and working together to create the final piece of music. It is also worth remembering that while some of the students play concerts fairly regularly, for other students this was possibly the first time they had performed in a venue like The Hexagon. It is also worth remembering that while some of the students play concerts fairly regularly for other students this was possibly the first time they had performed in a venue like the Hexagon. In terms of individual success stories there were many, but the fact that some of the students with special educational needs were so heavily involved in the final performance, singing solos and operating some of the sound effects. It was also obvious that the project gave extra confidence to participants from all backgrounds. From the Maestros side I saw Harry and Elijah (two young trumpet players) not only play with more confidence but also increase their creative input as the project progressed. 3. drums out, computer voice joins, all out except computer voice.